Measurement of impedance (Inductance), phase angle and (power) loss. 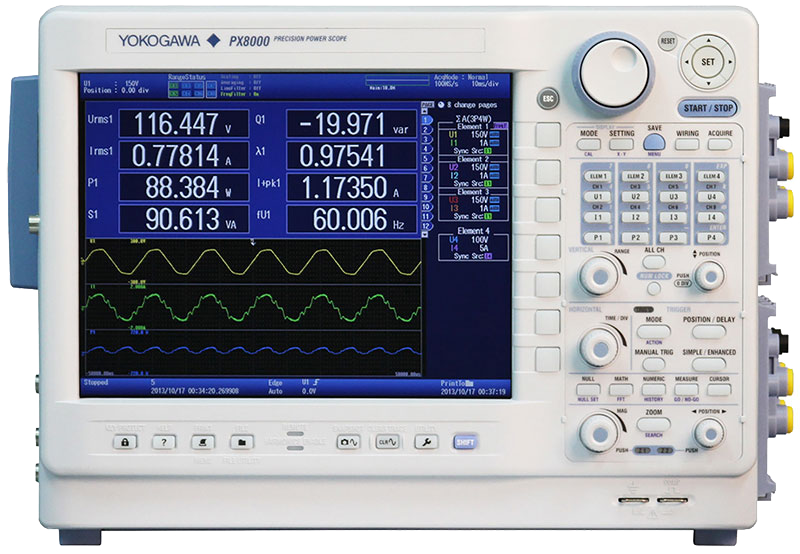 PX8000 measures various parameters of impedance (Inductance), phase angle and (power) loss from high-frequency signals impressed on magnetic components, and displays such parameters. PX8000 with 4 input modules measures loss of primary and secondary output of the transformer. Characteristic measurements, including DC current and inductance is measured by impressing a distorted AC signal of several tens to several hundreds kHz with changing DC current. PX8000 can measure both the high frequency distorted waveform and the DC. The PX8000 performs the functions of three instruments. Waveform observation, value display and harmonic measurements are performed in one instrument, saving the user test and evaluation time, cost and space for many instruments. The measuring results are highly reliable because the numeric calculations are based on the waveform data. You can input signals without using isolated amplifiers or current sensors. This reduces the error of such accessories.